A first draft of memoirs by suspended Labour MP George Galloway has been stolen by burglars from his holiday home in Portugal. The Glasgow Kelvin MP arrived at his cottage in the Algarve on Friday evening to find his computer, desk and chair all missing. Mr Galloway said he had no idea when the burglary took place because the house had been empty for six weeks. The memoirs, which he hoped to have finished by the end of the summer, were on the computer, but Mr Galloway said he had other copies of the draft. He said the burglary appeared to be no "ordinary crime" and that the raiders were "doomed to disappointment" since there was nothing "remotely of interest" apart from his first draft. Police were investigating the break-in at the £82,000 converted farmhouse. Mr Galloway said the thieves had worn gloves and would have needed a four-wheel drive vehicle to reach the remote farmhouse. Most burglaries in the area were "drug-fuelled" and "reckless", he added, suggesting that the break-in appeared suspicious. "There are some things that point in the direction of an ordinary crime, and others which point in a different direction. "I think the most salient of those was the desk, which is quite large and fairly cheap. "There is much nicer furniture which would have been easier to carry," he said. "Whoever is responsible for this, I'm afraid is doomed to disappointment because they will find nothing remotely of interest in the computer or the desk, unless they find the first draft of my memoirs interesting. "They have avoided having to pay £19.99 for it when it comes out." 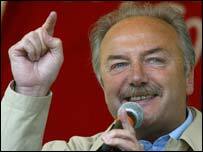 Mr Galloway is currently suspended from the Labour Party over a fierce attack on the prime minister and the US president over military action in Iraq.